As expected today’s re-opening, after 25 years, of our very own local 18th century Gothic-style tower was a great success. 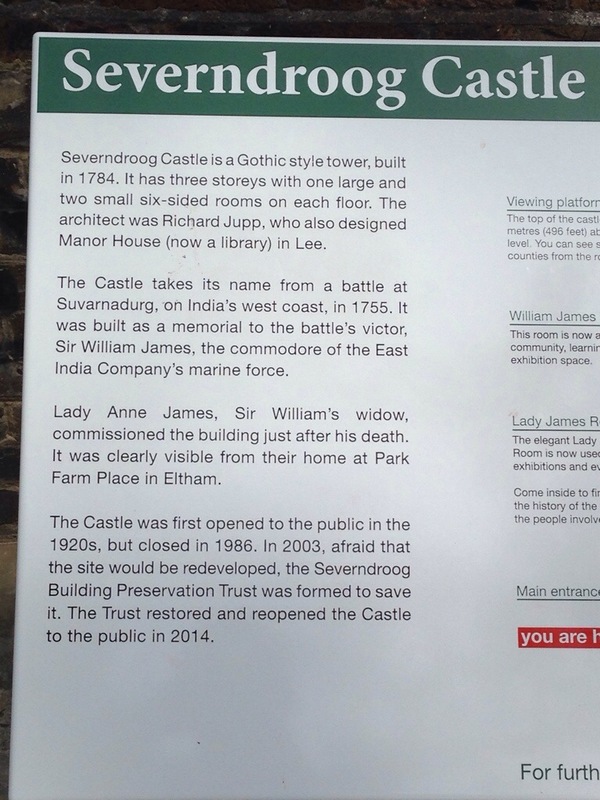 Yes, Severndroog Castle is back in business for stunning views, magical woodland walks and lovely teas. 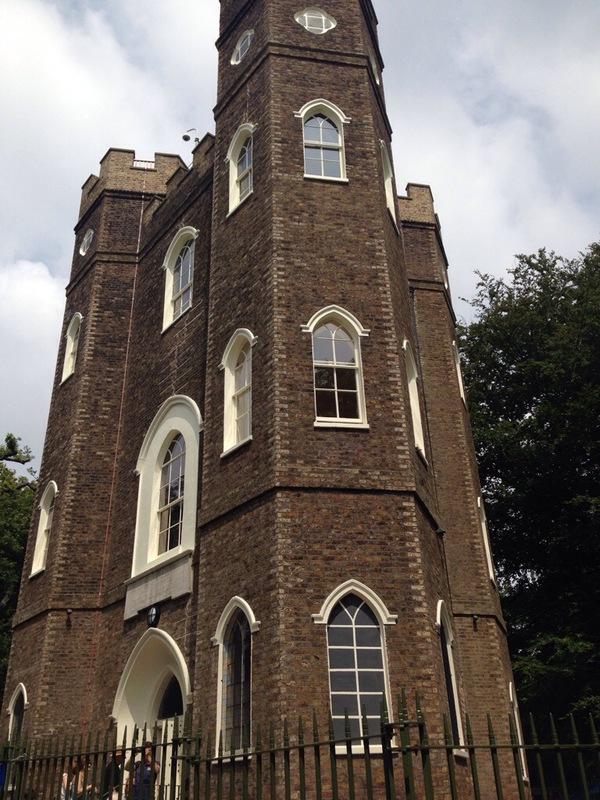 Perhaps the most striking thing about Severndroog is its setting. It’s like nothing else in London and feels like it. The approach to the castle sees the visitor meander through a centuries old wood and with each turn the anticipation builds. When eventually the castle is reached it’s like something out of a fairy tale. The views from the top are second to none with the full panorama of London on display. Inevitably in these days of the smart phone this lends itself to selfies and the admirable people behind the @severndroog account have capitalised with the #severndroogselfie hashtag – do use it when you’re up there. It’s also well worth a walk round the woods, perhaps heading up Shooters Hill to emerge at the Oxleas Wood cafe for more lovely views and tea. 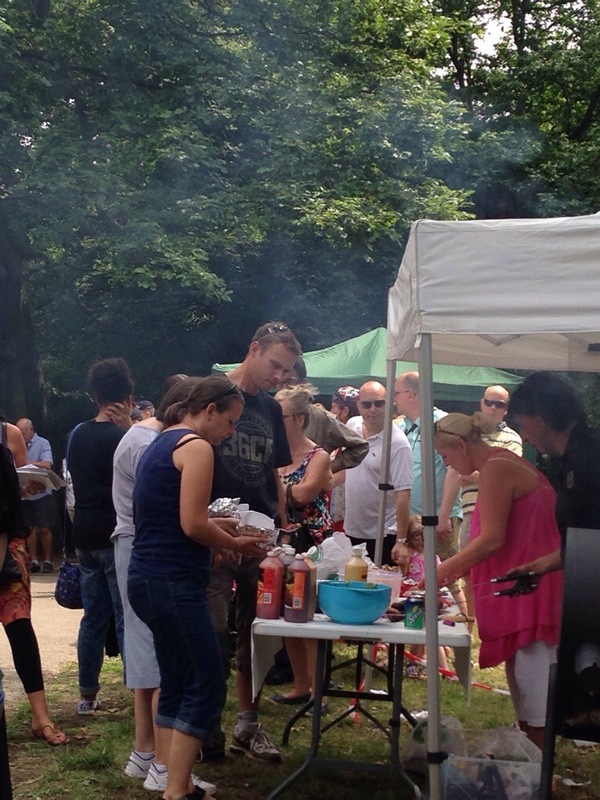 The grand opening day itself was a jolly mix of acoustic music, story-tellers, owls, burgers and sausages (which was a somewhat disorganised affair it has to be said but worth it in the end), various games and – have we mentioned yet – tea. Mostly manned as far as this Radical could tell by volunteers – including the Scouts. 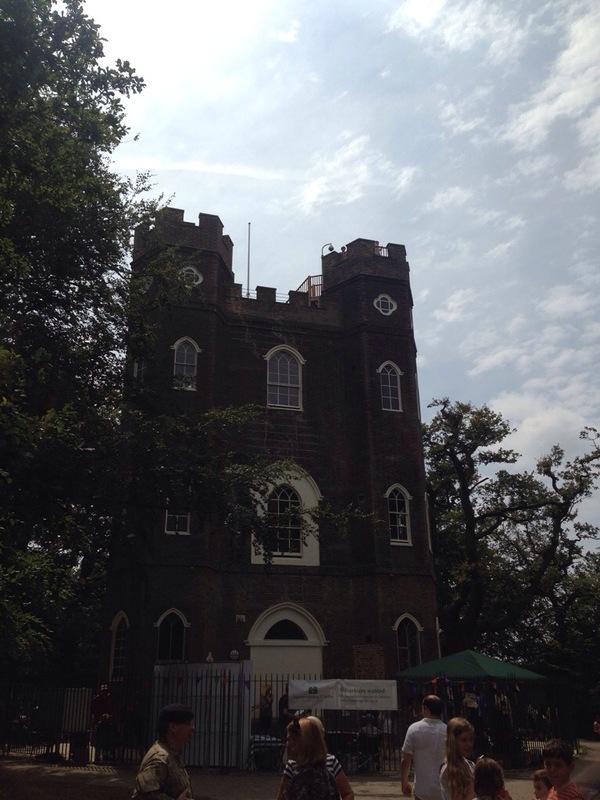 Well done all, not least the Severndroog Castle Building Preservation Trust. The weather helped and the opportunities to lounge around on the grass and take it all in made for a special day and no doubt for many more to come – it would, for example, be an ideal setting for a beer festival or some kind of outdoor theatrical production. The cafe is open each day apart from Monday from 09.00 to 17.00 and the castle on Thursday, Friday and Sunday from 12.30 to 16.30. Details to be found here (www.severndroogcastle.org.uk) – though the Radicals would advise alighting the 486 or 89 at the stop before Memorial Hospital and walking up the Hill if coming from town rather than going past it and waking back on your self. Possibly after a quick stop at the great local boozer the Red Lion. Do pay this place a visit when you have a moment – and don’t forget to take your selfie! – the mind-blowing thought that shortly Grace Jones may be hula-hooping on a stage at the OnBlackheath festival! And not doubt much more beside. It really is an area on the up and the enthusiasm of those who live and work here is palpable. Well, almost everyone. 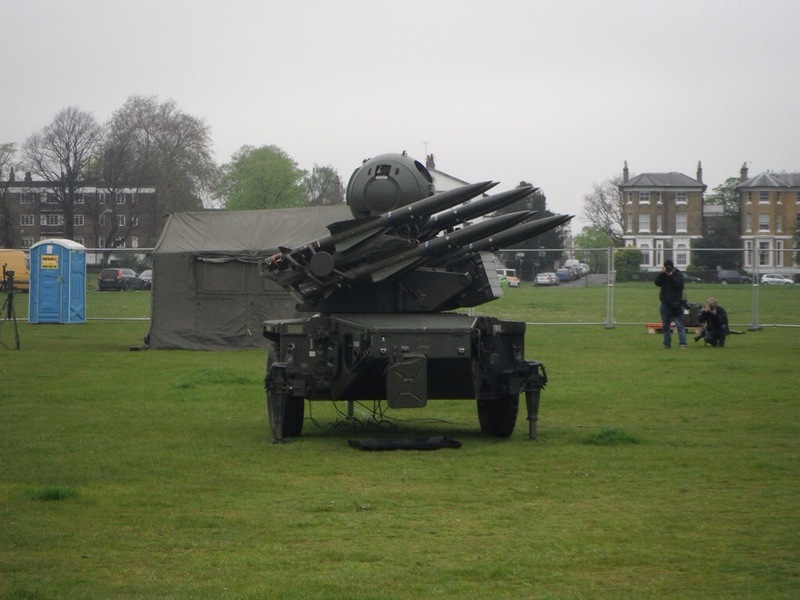 And so it is we return to the Blackheath Society and their latest newsletter. Now, the Radical view of the Society has been set out before. And, though it’s highly doubtful they have a view on this little old blog, and rightly so, but if they did it would presumably be similarly praiseworthy. Which is as it should be. But even by their own standards, the grudging, surly, seething tone of the latest BS newsletter – specifically the main article covering the OnBlackheath Festival – is something to behold. Forget about the noise level of the concert, the sound of grinding teeth as that article was written must have been deafening! If ever an article failed to capture the prevailing mood of an area it is this one by the Society with its killjoy musings on noise levels and alcohol licenses, not to mention the (highly dubious actually) concerns for the acidic grass! All that being said – and coming back to funny mood your Radicals are in – there is one part of the Society article with which we can agree. And that is the call for volunteers to provide information on the Festival, “favourable or unfavourable”. Well as we’ll be there anyway, with the intention of providing life blogs and tweets, how could we refuse this local call to arms? So, count us in! As always, we’ll report what see without fear or favour. Indeed if there are particular aspects of the event that we can cover, just let us know. One Radical is something of a national expert on portaloos and so will happily providing a detailed account of how they perform. And it’s likely we’ll spend some time at the various bars on offer so we can gladly report on 9.30pm deadline for the sale of alcohol (well, perhaps not gladly). We Radicals have been pretty enthusiastic about all the activity in the area this summer and we thought it could not get much better after Grace Jones was announced for OnBlackheath. Then we discovered pop-up cinemas coming to the area in August and September. On 25 & 26 July at Mycenae House in the Standard Pop Up Screens will be showing the modern classic ‘Shaun of the Dead’ and ‘The Full Monty’. Tickets are £10 per night or £15 for both. Full details here. 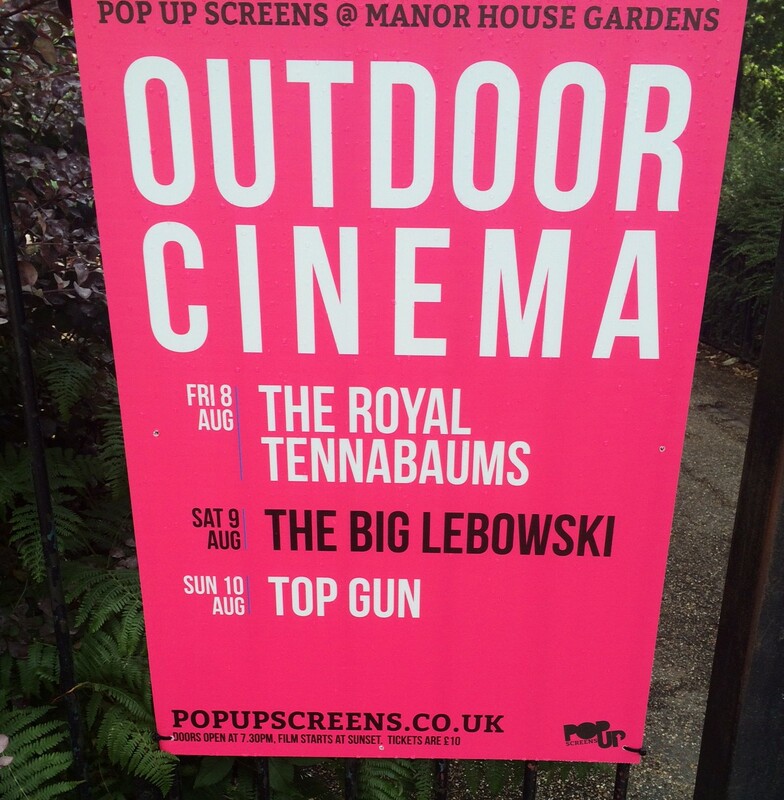 Then at Manor House Gardens on 8, 9 10 August three great films, ‘The Royal Tenenbaums’, ‘The Big Lebowski’, and ‘Top Gun’ will be showing. It is £10 per night or £25 for all three. All MHG details are here. If that is not enough Manor House Gardens will also be showing ‘Fight Club’, ‘Moulin Rouge’ and ‘American Beauty’ on 5-7 Sept and over in East Greenwich at the Pleasaunce you can finish off the summer with ‘The Goonies’ and ‘Forest Gump’ (details). All venues offer food and drink concessions (cash only) and don’t forget it still gets chilly at night so take a jumper. So if The Dude is your sort of guy, you feel the need for speed, are having a mid-life crisis, or miss the truffle shuffle grab the tarten rug or a chair and head on down. One evening this Radical felt uninspired by the offerings of the fridge and ventured down to newly opened Rox Burger on Lee High Road. 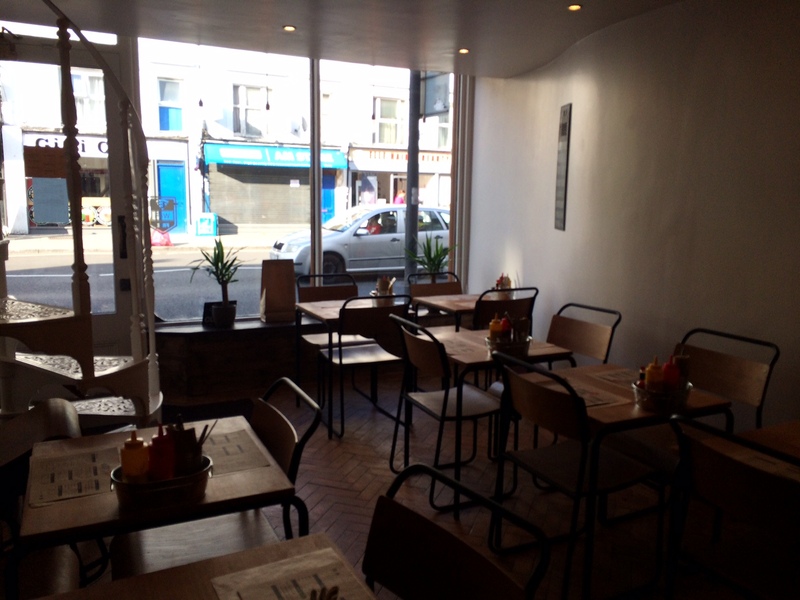 It was less than a month ago that the new burger restaurant opened just on the edge of Lewisham (82 Lee High Road to be exact) and the owner advises that business has been sprightly. It may be not what you might expect in Lewisham but if you like the temporary Model Market, Rox Burger is well worth a visit. Inside the restaurant can seat about 14 plus it has a mezzanine level that can be used for small gatherings. On to the food. This Radical’s burger consumption is normally limited to pub food or the BBQ and a burger-focussed restaurant would not normally be first choice. But the simple and welcoming exterior and interior suggested Rox was something a bit different. 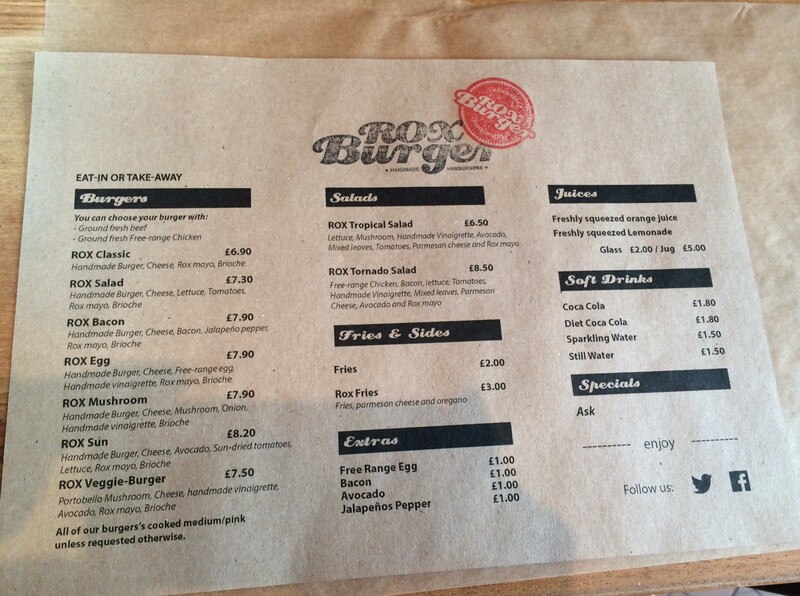 The menu seems to cover most bases and offers beef or chicken in a variety styles and all in brioche buns. 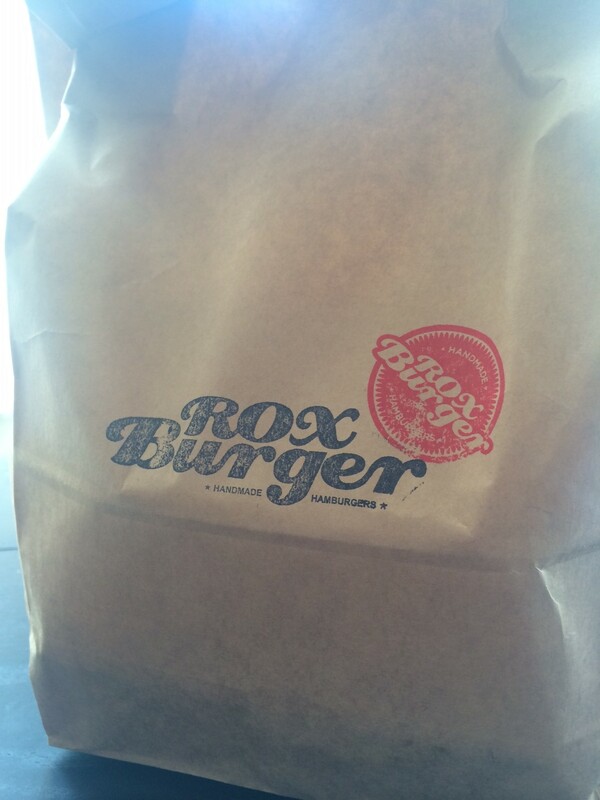 Keeping it simple I went for the Rox Classic (beef, cheese, mayo) with Rox fries (with parmesan and oregano). On ordering I was pleased to hear that the default option is medium rare. I was going for take-away and it took about 5mins. In which time I learnt that the owner is awaiting an alcohol licence and is considering expanding the service to include delivery – I was also offered a glass of water to keep me going (rather quaintly available in recycled jam jars). The burger was good. Cooked well, not chewy and with just the right amount of cheese and mayo. 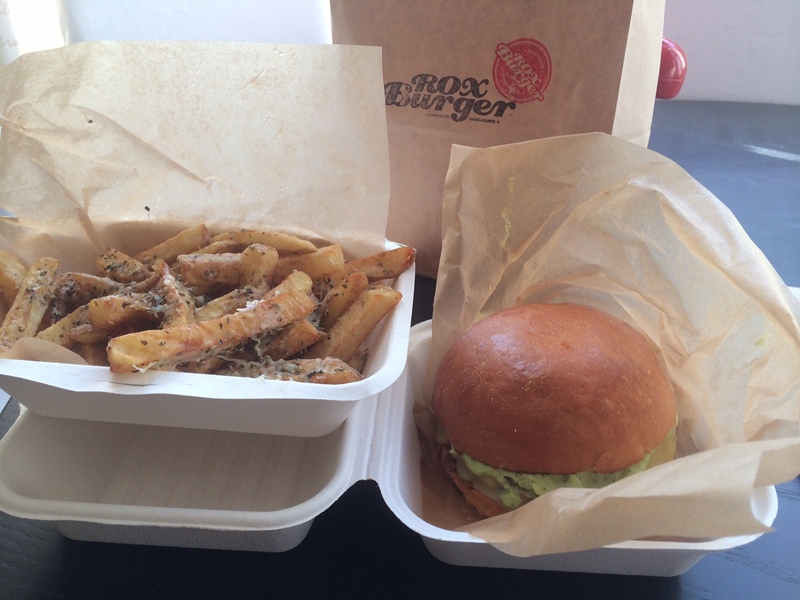 In hindsight the oregano and parmesan on top of the fries was a bit too much for me but might have gone down better with a chicken burger or one without cheese. Although all come with cheese the menu will be changing soon and as the burgers are made to order it would be possible to ask for one without cheese.